Teaching students how to build positive social lives is a must. And not just because middle schoolers are obsessed with their social lives. But because the status of our social well-being matters a lot. Like, determine the overall quality of your life a lot (watch this). Connection. Friendship. Belonging. Not only are these the driving forces of our social well-being but also the foundation of happiness, confidence, and security. And what’s more important in life than being happy, living with confidence and feeling secure??? Simply put, increasing social well-being increases overall well-being! So how do we boost student social well-being? Teaching students how to build positive social lives is a must. Enhancing social well-being all starts with learning how to be a good friend. So to teach my students how to be a good friend, I put together a list of 12 social habits that everyone, not just middle schoolers, can practice to build healthy relationships! Smile and say hello. This simple act is like opening a door to the possibility of new relationships. Be brave. Leave your comfort zone. You’re never gonna make new friends if you play it safe. Sit at a new table a lunch. Join a club that none of your friends are in. Partner up with a stranger in PE. Always choose kindness. Kindness begets kindness. It’s really quite magical. Be genuinely interested. People feel so honored when you pause to genuinely be interested in their life. It is such a simple way to show that you care. Experience empathy and see the world from different perspectives. Everyone is walking a different path. Taking the time to understand someone else’s journey powerfully impacts the way you see the world and enhances your ability to connect with others. Laugh and have fun! Don’t take life too seriously, just enjoy the ride. Be loyal, trustworthy, and honest. You can never go wrong by being loyal. keeping people’s secrets, and sharing honestly. Show up. Show up when it’s easy and fun. Show up when you say you’re going to show up. Show up when it’s hard and uncomfortable. Be present (Yes, that means getting off your phone). Don’t let your phone block your view of reality. Listen intently. We all want to be heard. Take time to fully and wholeheartedly listen to people when they open up and share. Be humble and apologize when you mess up. You’re gonna mess up. It happens and it’s okay. That’s life. So when it happens, own it, apologize, and grow from the experience. Be you. There’s the only one you. Don’t deprive the world of your unique self. How can you promote these habits in your classroom? While I can’t help you model these characteristic or coach your students for you, I do have some free resources (see above) to help remind your students how to be a good friend. The “Be a Good Friend” Checklist – – Use this checklist as a quick reminder in student binders, above water fountains, in the bathroom, and on lockers. 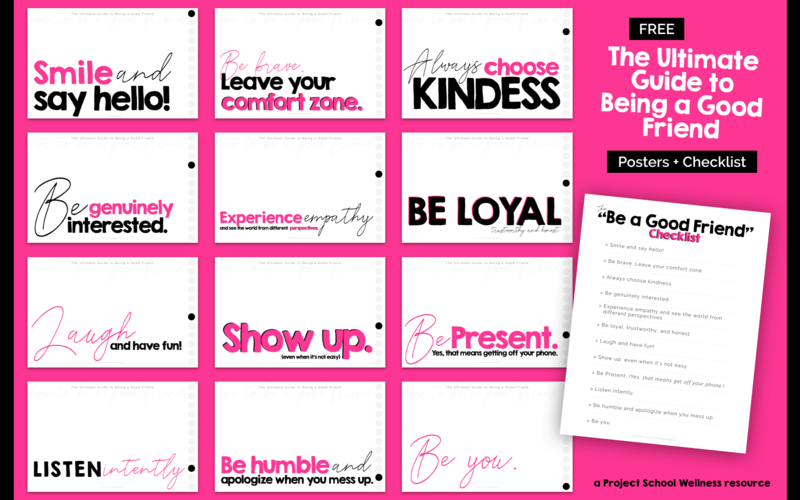 How to be a Good Friend Classroom Posters – – Keep these 12 social habits on your student’s’ minds with these bulletin board posters in your classroom or in the hallways. And be sure to tune into my next post because I’ll be talking about how to create a standard of kindness in your classroom and school.